...just how old are those two old guys anyway? Are they old enough to be responsible for the crop circle depicted in the image above? I think not. This is a detail: from a woodcut illustration, of the famous Hertfordshire Mowing Devil of 1678. There is obviously more to crop circles than many would have you believe. Now I have no doubt that a great many circles are the work of hoaxers skulking around the countryside in the dead of the night. In fact some of these modern day mowing devils seem to have transformed their nocturnal acts of wanton vandalism into gainful employment. After all, they couldn't do what they do whilst holding down a day job – could they? Perhaps they work double shifts. Furthermore why are these people not prosecuted for the criminal damage that they inflict on the property of our poor, struggling farming folk? The evidence of their criminal activities is there - for all to see - on their own web sites: such as circle makers.com, which feature pictures of their nefarious handiwork, along with incitements to criminality in the form of 'how to create your own crop circle' tutorials. Who is picking up the tab for all of this? Ok. It is accepted that the majority of crop circles are made by either hoaxers, pranksters or two old guys – who really should know better – and that all of these have no respect, whatsoever, for other people's property. The only mysterious aspect to all of this is the motives of the people that create fake circles. These motives become even more suspicious (and prompt the question, 'Why do they bother?') when this phenomenon is examined in greater detail. I say this because it really is quite easy to spot the differences between faked and genuine crop circles. So I will point out - for the benefit of those people - that there are some very serious minded individuals taking a long hard look at the crop circle issue. Foremost amongst these has to be the BLT Group at MIT (the Massachusetts Institute of Technology: where future American rocket scientists are educated). Some of the illustrations that I will be using to set out my argument are provided by this group (NB I am not claiming that anyone at MIT supports my argument). I have provided a link to this group's website at the end of this article. So how do we go about differentiating between the faked and the 'for real' thing? Simple, we look for features that one type possesses that the other doesn't. For instance, a great many 'faked' crop circles feature plank marks that cut directly across the lie (near enough at a right angle) of the trampled plant stems. Easy enough for anyone to spot. Genuine circles never possess this feature. The more telling details, however, come from examinations of genuine circles. Look at the picture below. 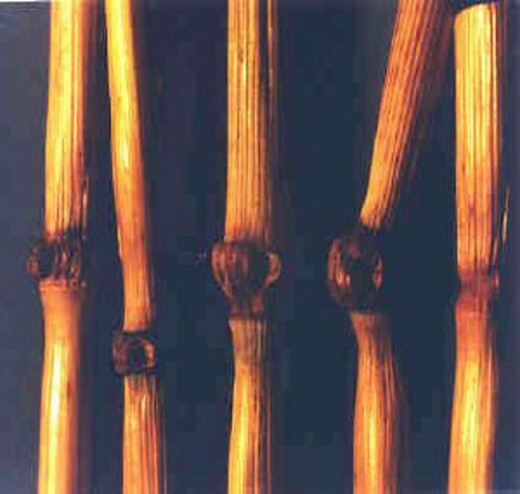 You will notice the 'knee shaped' deformation of the stem nodes. 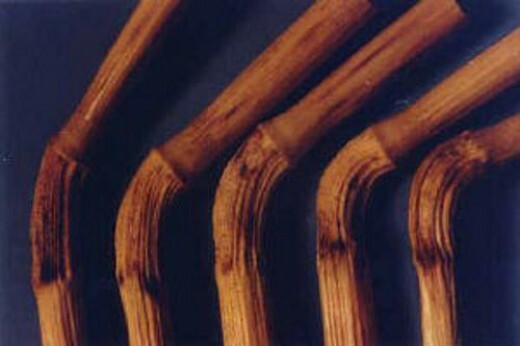 This type of deformation is never found in normal plants or fake crop circles. No one has an adequate explanation for how this deformation occurs. It seems to involve heating (of just the node), stretching (by up to a staggering 172%) and – obviously – bending. This effect could not be achieved by any known mechanical process – certainly not by stamping down on the crop with a wooden plank. Things get even more bizarre with our second abnormality – an abnormality that, again, is only to be found in genuine crop circles (although not in every case). These nodes feature cavities that could only have been produced by the rapid (extremely rapid) heating of the moisture that they contain until it becomes steam - steam that then expanded explosively and erupted out of the nodes to leave these expulsion cavities. What process produced this effect? A process that involved an old guy with a plank? The only – thus far – postulated explanation for this effect is that the nodes have, somehow, been exposed to a sudden burst of micro-wave radiation. This explanation, however, poses more questions than it answers. What technology was used? Who used it? To what purpose? At this point I'm going to repeat a question I asked earlier. Crop circle makers/fakers cannot reproduce these effects – so why do do they bother? This is important – keep asking yourself this question. There is, of course, the possibility that crop circles are created by some kind of natural process that has yet to be be identified and understood. One, nascent, theory: that seems to be gaining ground among those researching in this field (sorry), relates to plasma vortices. A brief note of explanation. The plasma 'state' is considered by many scientists to be the 'fourth state' of matter. We are all familiar with solids, liquids and gases: the three 'normal states', a plasma 'state' is created when a gas is super-heated until the molecular and sub-atomic structure of the gaseous material is broken down and its constituent sub-atomic particles – electrons, neutrons and protons – become disassociated (they part company). The plasma vortex theory began to emerge after another feature, unique to genuine circles, was discovered. See picture below. What you are looking at here are microscopic (typically 10 - 50 microns in diameter) iron spheres mixed together with an 'iron glaze', and soil, from within a circle formation. The upper arrow is pointing at a perfect sphere of pure iron. The lower arrow is pointing at an ablated sphere (ablated - eroded, evaporated by heat). This kind of material is not, generally, distributed evenly throughout formations. It is sometimes found: in fused aggregate masses, concentrated at the centers of circles or – conversely – distributed around the circumference; which would indicate that centrifugal force played a role in the distribution. It has also been found distributed linearly: in straight lines, radiating outward from the center of circles and, also, embedded in the stems of the afflicted crop. If you think all this to be a little confusing then get this – all of this ferrous material: and we are talking about tens of thousands of microscopic spheres here, has been magnetized. At this point I'm going to ask you again: a couple of guys with planks and a ball of string – in the dark? Get real. There are other anomalies that I could pursue here but - for the sake of brevity - I'll mention just one more. In some instances the affected crop is not killed off by the flattening process; it is, however, rendered sterile: it does not produce any seeds. Let 's now get back to the plasma vortex theory and ask, what kind of conditions could produce the magnetized iron spheres that I have described here? The required conditions would have to include high temperatures: to melt the iron allowing for the spheroidal configuration, and an electrical field to magnetize it. These conditions – for those of you who haven't already guessed - can only be found within a plasma field. Now all we need to work out is what generates the plasma field and where the the iron comes from. Fortunately we have a clue to at least part of this conundrum. 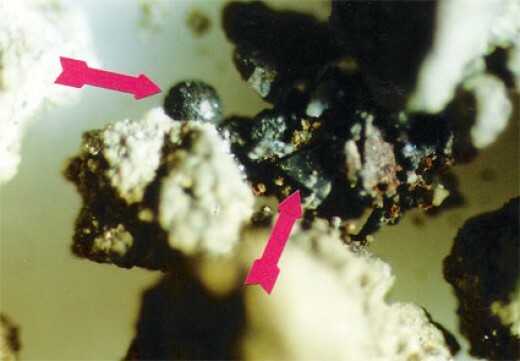 When analyzed the composition of the iron spheroids was discovered to be virtually identical to that of meteoritic iron. Ergo the iron that researchers are finding scattered throughout crop circles: all over the world, is from outer-space. This does not mean that we now need to introduce extra-terrestrials into the equation. No – what I am now going to attempt, instead, is to take the partial, plasma vortex theory and flesh it out into a fully fledged hypothesis. To begin. Where then: out there in the solar system, are we to find the origin of the meteoritic iron that will – eventually – end up scattered throughout a crop circle in, for instance, Wiltshire? A good place to start would be the interplanetary space between the orbits of Mars and Jupiter. This is where we find the asteroid belt: millions of objects, of varying sizes – some composed, almost entirely, of iron – tumbling along their trajectories at 25 kilometers per second. Occasionally there will be a collision between two, or more, of these bodies – when this happens material can be sent spinning away in all directions – and some of it, will come spinning our way. Lets, now, follow the progress of an iron rich rock that has been dispatched in precisely this manner. To reach us here our lump of ferrous material must travel inward toward the Sun at center of the Solar System. This means that it is traveling from a relatively cold region into a much hotter area. Therefore, as it gets nearer to the Sun, it is exposed to greater and greater extremes of temperature. Let me explain. On Earth the heat of the Sun is dispersed, or diffused, by our atmosphere: this evens out the mean temperature and keeps it within tolerable (for us) limits. Out in space: a near vacuum, things are different - there is no atmosphere/heat dispersion mechanism. An object out here will be exposed to extremely high temperatures when in direct sunlight; and extremely cold temperatures when in the shade. Our rock is tumbling through space so the surface area that it exposes to direct sunlight is constantly changing. When turned toward the Sun the surface temperature of the rock can reach hundreds of degrees Celsius – when turned away it can plummet to minus hundreds of degrees. This thermal stress causes the surface to expand and contract continuously; over time this leads to it becoming cracked and chipped with pieces flaking away. The flakes produced in this manner are, of course, subject to the same process so they are eventually broken down into dust. So now we have a meteorite: consisting mainly of iron, surrounded by a cloud of ferrous dust and debris - inbound for Planet Earth. This is what will impact the tenuous, upper reaches of our atmosphere 100 kilometers above the Wiltshire countryside. We all know what happens next, with regard to the space rock and the debris: they become incandescent, and burn up as they streak across the night sky. However this is not, necessarily, the fate that will befall the microscopic dust particles in the cloud. These tiny particles of iron are small enough to 'register hits' on individual molecules in our atmosphere. They collide with – and rebound off – single molecules of nitrogen and oxygen: the most abundant elements found in our planet's gaseous envelope. These multiple impacts slow the particles down which ensures that they will not burn up and that they will, in fact, reach the ground. Things get a bit complicated at this point so I would ask the reader to pay attention here. To simplify matters we can try and visualize what occurs with just one of these collisions. An iron particle impacts a gas molecule. The particle ricochets off the molecule and also imparts motion (through kinetic force) to the molecule (just as the cue ball imparts motion to the target ball in a game of pool). Before they both go careening off in different directions, however, something else occurs. An electron is transferred from the iron particle (which is saturated with electrons) to the gas molecule (which has a great deal fewer). This means that – when they both part company – the iron particle is minus one electron and the molecule is plus one electron. This process is repeated over and over and as the iron particle loses more and more electrons its positive charge potential increases. The opposite is happening with the molecule: it is picking up more and more electrons so its charge imbalance becomes more and more negative. Now there has to be a mechanism which keeps our molecule hanging around: in the vicinity of the iron particles, long enough for it to receive repeated hits. There is such a mechanism: I call it the, 'Pin ball effect.' Imagine a molecule at the center of our cloud of meteoritic dust particles. Lets say, for the sake of argument, that this molecule 'wants' to escape the clutches of the cloud. To do this it must travel outward from the center to the edge and beyond. Every time it attempts to do do this, however, it takes a hit. In other words the molecule is acting like a pin ball trapped within the cloud/pinball machine. This means that some of the gas molecules that became incorporated into the cloud when it first entered the atmosphere: 100 kilometers straight up, will still be imprisoned inside it when it reaches the ground. There are other factors which speed up and intensify the processes that are at work here. The easiest of these to explain is that – as the particle, molecule mixture descends – the air gets more and more dense: allowing for more and more impacts to take place. Next comes a crucial step. As the iron particles lose more and more electrons – and their positive potential increases - the electrons that they retain will have to work harder: move further and faster, to preserve the particles own molecular structure. Moving electrons generate magnetic fields. The iron particles have now, therefore, become temporary magnets. This affects the way they behave within the mixture. Magnets, as everyone knows, possess polarity: they have positive and negative poles. Most also know that – when two magnets are placed together end to end – that they will either repel each other (if placed like pole to like pole: eg negative to negative) or attract each other (if placed unlike pole to unlike pole: eg negative to positive). Now our magnetic particles are bouncing around in a chaotic manner – this means that their respective magnetic polarities will, also, align in an equally chaotic manner. This brings a whole new dynamic into the equation. Now – besides just ricocheting around, at speed, off the molecules and each other – the likelihood that an impact will occur rises exponentially as the forces of magnetic attraction and repulsion comes into play and creates even more movement. The mixture is now fizzing with activity that: through friction, generates heat. The heat dries out the humid summer air that has, until now, acted as an insulator. The air itself will now conduct electricity. Our mixture contains tens, perhaps hundreds, of thousands of positively charged anodes in the form of microscopic iron particles. It also contains, maybe, millions of negatively charged diodes in the form of gaseous molecules. The stage is now set. Electrical discharges begin sparking and zipping though the particle cloud/gas mixture making it glow from within. The frequency of the flashes accelerates and the temperature rises dramatically as the molecular gases present are broken down into their sub-atomic constituents and the iron present melts to form spheres and becomes permanently magnetized. We now have our plasma. This is not, however, the end of the story. We need that plasma to behave with cohesion, we also need a mechanism that will constrain the plasma within a relatively small volume and stop it from dissipating through contact with the surrounding air. We need a vortex. This part of my theory is a bit speculative. Plasmas are known to respond to magnetic fields. Those huge loops of material that rise above the Sun's surface (solar prominences) are plasma and gas conforming to magnetic field lines. We know that our mixture also contains plasma and gas and that it is seeded through with magnetic iron spheroids. The spheroids are embedded in their own tiny magnetospheres – with their own lines of magnetic force: just like those found on the surface of the Sun.. The plasmatic material now begins to travel – like an increasing amount of traffic joining a one-way system - along the field lines surrounding these iron seeds. As the fields intensify – and the magnetic material aligns sympathetically (IE unlike to unlike pole) order begins to replace chaos within the glowing cloud. As the material becomes more and more organized mere order is superseded by an evolving, fluidly rotating structure with, perhaps, orbital elements and: where before there was the chaotic, commingling of individual entities, there now exists a single - self configured – system. This system is closed off from the surrounding air because the magnetospheres centered on individual spheroids: which are all now in sympathetic alignment, have merged – come into phase with one another – to become a single unified field. Electrons can now flow through this extended field in structured, arterial streams that form a three dimensional, geodesic lattice or shell that encloses the system and prevents the intrusion of outside material by exerting electromagnetic repulsion. We now have our rapidly rotating – and descending - plasma vortex. 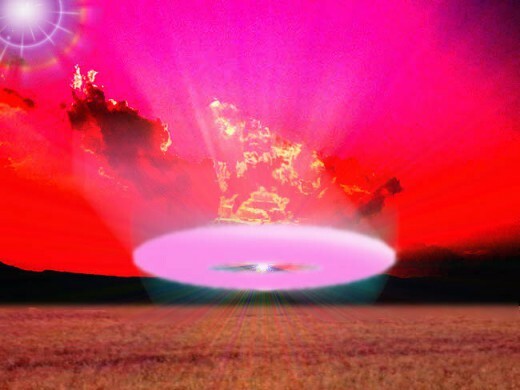 So we have our plasma vortex – now we can create a crop circle – right. Sorry...wrong. We still need just one more element. Not to worry though – this last feature isn't in the least bit complicated. The final item on our list is a shock wave. If you have ever watched a competition swimmer in action you will have noticed a wave that forms directly before the swimmer's head as he or she progresses through the water. Swimmers turn their faces into the rearward slopes of these waves to breathe. These are shock waves. Our descending vortex - traveling at, perhaps, trans-sonic speeds - develops a preceding shock wave because the air beneath it cannot move out the way fast enough. The air within this region is both denser than the surrounding air and: because it is generated by a rotating body, it has also acquired transferred rotation. We now have everything we need – lets make a crop circle. ...plummeting down from above. The vortex slams into it. The rapidly spinning shock wave is the first element to make contact. This snaps the heads of the crop over at right angles to the perpendicular. Now the second element. The hot plasma reaches and heats the nodes below the heads and bombards them with a ferocious - gatling gun - stream of charged electrons. These smash into the molecules that make up the cell walls of the plant's microscopic sub-structure and strip out the low energy electrons that bind them together. The nodes now morph, actually mutating in real time and becoming elongated. By now the iron spheroids are spiraling in at speed – impacting the plant stems and contributing to the 'push down' effect. The shock wave now reaches the ground. Here it, momentarily, forms a cushion of compressed air. When the molten iron spheres at the bottom of the vortex hit this cushion they instantly decelerate allowing the descending material above to catch up. The iron is now concentrated into a single, thin sheet suspended (for about a nano-second) a couple of inches off the ground. Its remaining charge potential now discharges in one, final flash into the dissipating plasma. The heat generated causes the plant nodes nearest the ground to explode whilst – at the same time - the iron splashes out to become a thin iron glaze: shot through with iron spheroids, coating the soil. And there you have it: a crop circle (with nary a plank - or ball of string - in sight). I would like now, if I may, to indulge myself by asking a question. Does the scenario/theory that I have set out here adequately address the crop circle issue? I have to be honest here and admit that, for my part, it does not. The problem I have with it is that there are strange phenomena associated with crop formations: many reported by eye witnesses, that cannot be explained by anything that I have written here. So I am not going to write ET out of the equation completely - not just yet. Another major niggle I have relates to the massively concerted – and expensive - effort that is being made to convince Joe Public that crop circles are purely the result of the infantile antics of crop circle fakers. This leaves me with the impression that someone, somewhere knows something about crop circles that the rest of us do not. I am also convinced that there is, indeed, someone, somewhere that is seriously spooked by this whole issue. Be advised that this is a scientifically orientated site and can be heavy going – it is, however, still a worthwhile exercise.